A Ghanaian worker helping to build the 2022 World Cup had the trip of a lifetime when he was taken to the opening match of the tournament in Russia. Abdel Azeez Suleiman, 28, was among eight workers invited to accompany the former Barcelona star, Xavi Hernandez, to Moscow. Xavi is global ambassador for the tournament Qatar will host in four years’ time and head of the Generation Amazing programme, tasked with helping build football at grassroots level as part of its World Cup legacy. During their five-day trip to Russia, the group attended the opening ceremony and first match of the tournament at Moscow’s Luzhniki Stadium which saw the hosts beat Saudi Arabia 5-0. Abdel Azeez, a Liverpool fan and winger who played in The Workers Cup in Doha and currently works on the Al Rayyan Stadium site, said: ‘It was a dream come true for me to be selected to attend Russia 2018. It is a wonderful moment to be here because it was so unexpected. ‘I am very grateful and my family said that I am on my way to achieving my dream. I have followed football in Ghana for so many years. Through Qatar and through Generation Amazing, my dream came true’. 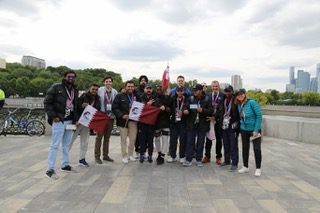 Among the party were also workers from India, Sri Lanka and Bangladesh, who were all hand-picked because of their work as coaches who could go back to Doha and inspire others. Xavi, who won the World Cup with Spain in 2010, said: ‘We have workers here from Qatar, but the programme also helps people in their home countries. As the word says, I think this programme is spectacular, so I am proud to have shared this experience with this group. ‘To be at the World Cup is a once in a lifetime experience, and I too am learning a lot every day from all those taking part in the fantastic project’. Generation Amazing, which was set up by Qatar’s Supreme Committee for Delivery and Legacy, hopes to benefit a million people around the world by 2022 by promoting football at grassroots level. Dawood Irfan, from India, said: ‘One of the best experiences of this trip was being with Xavi. He is a big star but very down to earth, we got to know him well in the workshops and he shared his experiences and his challenges, as well as how he overcame them. It inspires me to be part of this project. Football breaks down all the barriers’. Qatar will also be taking sixteen youth ambassadors from Qatar, India, The Philippines, Nepal and Pakistan to the Russian tournament.